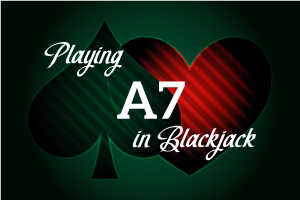 Ace-seven is by far the most difficult hand for the professional blackjack player to handle. Depending on what the dealer is showing, you will either hit, stand, or double down. Basic Strategy tells us that we should double if the dealer is showing 3 through 6, stand on 2, 7, and 8, and hit on 9, 10, and A. This may come as a shock to some since common sense tells us to stay with an 18 regardless of what the dealer has. Let's look at the math behind the strategy. First, we must look at A-7 as a plain old 18. Basic Strategy dictates that we stand on a pat 18 regardless of what the dealer is showing; we want to get to 17 or higher and then let Lady Luck determine the outcome. This isn't necessarily the case for a soft 18. If the dealer is showing a 2, the return on an 18 is $.12 for each dollar invested. For 3 through 6, this jumps up ranging from $0.40 to $0.50 per dollar. At 8, it goes back down to $0.11. 9 through A plummets into a negative return of $0.18 to $0.10 loss per dollar. So is it really worthwhile to go against the common sense factor and hit an 18 if the dealer is showing 9-A? Ace a negative return of $0.09. The spread here, while not seeming like much, is less than the -$0.18 to -$0.10 return of staying. To minimize the damage, hitting on these cards is a necessity. Doubling is the third option with this hand. In this case, you count the hand as an 8 and pray for a 9 or 10, or you count it as an 18 and hope for an Ace through 3. 9 through A gives us a -$0.29 to -$0.36 return, far greater of a loss than hitting. So doubling on those cards is out of the question. Doubling on 8 is also a negative return (-$0.03), whereas it's a positive return to hit. Again, out of the question. Doubling on 7 is a positive return of $0.22, which is less than the $0.40 you will get with staying. If the dealer is showing a 7, it makes economic sense to stand. Doubling on the dealer's 2 is also $0.12 return, but it is less than a cent less difference of a return than standing. In the long run, this adds up to major dollars, believe me. You will want to stay rather than risking the double in this case. That leaves 3 through 6. The math here gets tricky, so pay careful attention. The numbers above regarding standing on 18 don't take into account the power of the Ace. As you know, the Ace can be counted as either a 1 or an 11, and because of this, hitting on A-7 is not nearly as dangerous as hitting a pat 18. In fact, the 23% (3/13) chance of drawing a card to better your 18 makes the diminished return on doubling the right move. While the return ranges from $0.18 to $0.38 (compared to the $0.40 to $0.50 of staying), the 23% odds of improving plus the doubled amount of money pumped into the hand make doubling the most profitable choice.